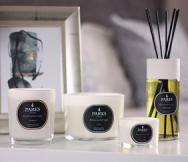 As a part of that range, our Thai Spa candle is not only a thoughtful and welcome gift, but also a lovingly crafted aromatherapy grade candle bearing the natural scents of eucalyptus, peppermint, grapefruit, cedarwood, lavender, rosemary and pine. The scents of cedarwood and pine form the rich, deep base of this package. Each brings not just the strength and reach of their respective trees, but also a deep, mellow tone that binds the lighter herbal scents into a coherent whole. Peppermint and lavender combine to add a sweet and lively, almost candy-like overtone, which gives the candle its high notes. Aromatherapists tell us they also help to elevate our mood and invigorate the user. Eucalyptus and rosemary work together to round out the mid-range of this scent combination, making sure that the whole is both healthful and rejuvenating. Eucalyptus is said to have healing properties, whilst aromatherapists say that rosemary is a stimulant scent. Lastly, grapefruit provides a dramatic counterpoint to the whole. Its tart citrus notes make themselves noticed as they blend perfectly into this rich orchestration of scents. Better still, this small candle will burn for as long as 50 continuous hours.